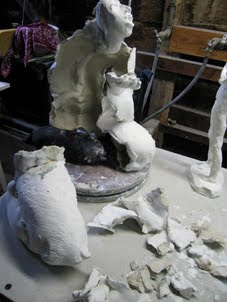 Those words of an old blues song came back to me as I tried to fit this big piece in an already 1/2 full kiln. Luckily it's paperclay so I can repair it. I was anxious to fire the kiln because I'm trying a porcelain slip over the rather uninteresting surface of the paperclay. I should do tests, but I want to see this in full size.